At DLVSC, we believe that having a variety of laser hair removal devices available is what makes us stand apart and gives us the ability to provide you with both safe & effective treatments. It’s impossible to predict exactly how many sessions will be needed to achieve your optimal hair reduction, so purchasing treatment packages is an option, but is certainly not required. Lastly, we also offer waxing and electrolysis services as alternative options. Yes. However, it’s very important that you be seen in person by a board-certified dermatologist or physician assistant prior to having laser hair removal treatments. Why? For starters, dermatologists & dermatology physician assistants are experts at assessing how your skin should react and respond to different treatments, specifically laser & light-based treatments. While they may ultimately entrust a well-trained nurse to perform your laser hair removal sessions, it’ll only be after they have chosen the safest/best device to use and determined that you’re an appropriate candidate. In terms of the devices themselves, we only use FDA-approved lasers that have been thoroughly vetted & tested by our expert physicians. Laser hair removal treatments can be effective for almost everyone; the key is to choose a dermatologist that has both the right devices and the right experience. While it’s true that laser hair removal works best on fair skin with darker hair, advancements of lasers in medicine have made it possible for virtually any skin type to be treated. Typically, Diode (LightSheer DUET) or Alexandrite (Clarity) lasers are the best choices for those with fair skin. Meanwhile, people with dark skin are almost always treated with an Nd:YAG (Gemini) laser. Lastly, only the miraDry device is capable of effectively reducing red, blonde and/or gray hair – currently this technology is only available for underarms. 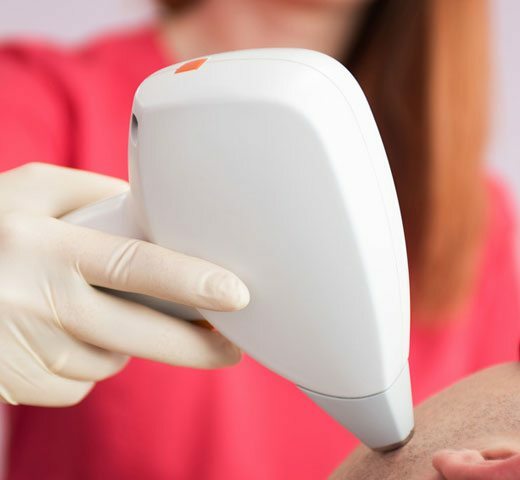 Laser hair removal treatments can be effective for almost everyone; the key is to find a dermatologist that has both the right devices and the right experience. Somewhat. Laser hair removal treatments don’t feel good, but they’re also not all that bad. For more sensitive areas or for people with a very low pain tolerance, we may use numbing cream, cool air, ice or cold gel to reduce discomfort. However, for the vast majority of people, these steps just aren’t necessary. Furthermore, certain areas – like the face and around the bikini line – are known for being more sensitive than others. Laser hair removal treatment is often described as feeling like a quick rubber band snap against the skin. With each session, the hair becomes thinner & finer, which also results in less discomfort. No, but…laser hair reduction is a better description. Once you’ve completed your treatment series, hair re-growth is highly unlikely for an extended period of time. Eventually, you will notice new hairs developing (they’re usually finer, thinner & fewer). For some people, it’s months or even years before this happens. However, a touch up visit annually or bi-annually can quickly eliminate this new hair.